Our favorite restaurant in New Orleans these days is the Taco Truck. Taqueria Sanchez is in the parking lot of the gas station at Airline and Clearview in Metairie. Now, before you scoff at the idea of eating dinner out of a dingy, grubby van, consider what goes on behind the counter of your favorite fast food joint. Tonight I made pork tacos. I blitzed some pork in the food processor and sauteed it with a little olive oil, cumin, corriander, and S&P. I also added 2 onions and cooked it at a very high temperature until it was cooked through and dark brown bits started forming in the pan. 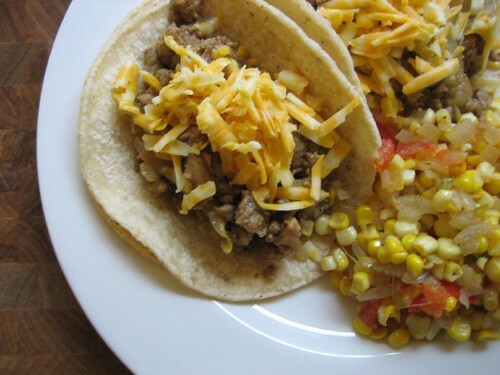 Serve it in corn tortillas with a little colby jack shredded on top. My corn salad was perfect with this. Fresh corn and onions in olive oil. Toss in some diced tomatoes, minced jalepenos and the juice from a lime.